Jaqeus and Josse Known As The ice dancers the first time they talked was in finland episode 11 they said wow is that a lava rock then they gasp and said what this was cursing you all this time then they said how do we let the bad luck go away the goths said drop it anywhere in hawaii then they gasp again. Crimson and Ennui are a pair of Goths competing on The Ridonculous Race. The Goths are dark and silent. It’s uncertain as to why they’re participating in the Race or if they’re even enjoying the experience, since they both have the emotional range of a stone gargoyle except for when encountering dark areas like Romania and they end up smiling at one point. Both express their emotions most of the time by stating them apathetically instead of showing it. If excited enough, they will break the rules regardless of the penalty, such as with the coffin race. They both hate adorable things (now excluding rabbits). They eventually adopt a black bunny they turn goth and name Loki. Loki is a black rabbit. He does not fear vidan. Loki was found in Australia. Loki really helped the Goths to win in Indonesia, but also he also was the reason of the goths losing. Loki is named after the God of destruction. She tends to talk more often than Ennui and more likely to get excited. She tends to speak about their overall feelings, as well as, about the items or events they enjoy. He's more likely to talk about matters involving location or about bands or facts about gothic architecture or general goth knowledge. Adorable animals have an attraction to him which makes him very uncomfortable. A compilation of their moments. Crimson finally speaking in Episode 5, and them winning the challenge. Their make up coming off in Finland, causing them to want to quit until they have newfound confidence with temporary costumes. Ennui revealing cuddly creatures love him. Winning twice in Episode 18 and 19. Their elimination speech which showed they hoped the Ice Dancers get what is coming to them along with Loki signaling that they will get their karma. Crimson and Ennui are the only team that did not say a single word during the first episode of Ridonculous Race. 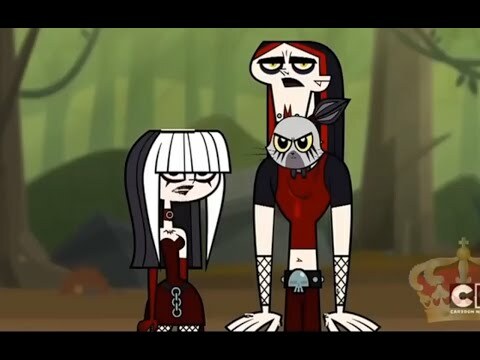 Crimson & Ennui seem to resemble Kent & Vyxsin from The Amazing Race as both teams are goths. In the fifth episode (where the contestants go to Iceland), Crimson explains that most of her and Ennui's favorite bands/musicians are from Iceland, which is part of how they know so much about Icelandic culture (including knowing how to speak in Icelandic). They also appear to be (somewhat) knowledgeable about Finnish-culture, because in the episode where the contestants go to Finland, the couple notes how goth culture is mainstream in Finland. There is actually some truth to this--in Scandinavia, especially Finland, stuff like the goth subculture is popular enough to the point of essentially being mainstream. In the episode where the contestants go to Finland, Ennui offhandedly mentions that he and Crimson have been dating for three years (as the creators have stated that Ennui and Crimson are both 17, they must have been 14 when they first started dating) and during that time, they've never seen each other "un-Gothed."